Michael Reily never expected to find himself raising a child. As a busy advertising executive and single gay man living in a conservative Southern town, Michael doesn’t exactly have parenthood on his things-to-do list. So when Michael discovers he’s been named guardian of his infant nephew, Scott, he finds he’s taken on the most challenging job of his life. But he’s determined to do it his way, with wit, resourcefulness and spontaneity. The moral outrage that his new position provokes galvanizes him to fight for custody of Scott, battling a close-minded, conservative senator – who happens to be the child’s grandfather – and a host of would-be moral arbiters in a courtroom showdown. And when fate throws some more surprises his way, he faces getting famous, getting rich, getting his heart broken and getting all the knots out of old family ties with the same originality. In a warm and assured voice, the author celebrates the many different forms a family can take and the triumph of individualism over straitlaced conformity. 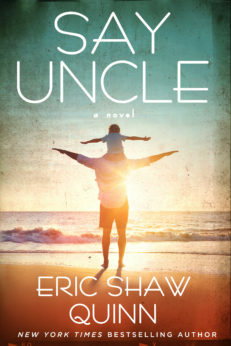 Hilarious, cheering and surprisingly wise, Say Uncle is bursting with life and love.